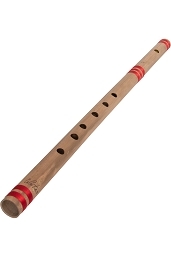 The bansuri is a transverse alto flute of India, Pakistan, Bangladesh, and Nepal, made of a lone stick of bamboo with six or seven open finger holes. 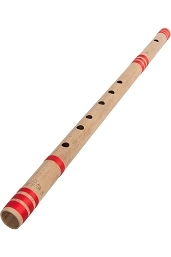 An ancient musical instrument associated with cowherds and the pastoral tradition, it is intimately linked to the love story of Krishna and Radha, and is depicted in Buddhist paintings from around 100 AD. 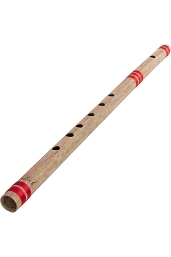 It is intimately associated with Krishna's Rasa lila; the tunes on his flute are poetically associated with driving the women of Braj mad. 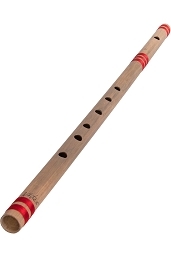 The North Indian bansuri, typically about 14 inches, was traditionally used as a soprano instrument primarily for accompaniment in lighter compositions including film music. 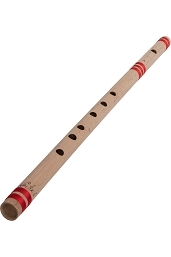 There are many size of bansuri from 14" to 30".